Well, well, well. Raiders head coach Jon Gruden has two things to celebrate today. Not only did his team win Sunday after the Steelers cratered their pants, but today Oakland fired general manager Reggie McKenzie after almost seven seasons, creating an opportunity for Grudes to gain even more power. As the Raiders search for a “new front office executive,” Gruden will be involved in the process. Hey, who knows—maybe that process will end up with him taking over the role, since he was reportedly the one who engineered the Khalil Mack trade, which turned into a delineation between his inner circle of personnel and McKenzie’s. Wouldn’t it be crazy if the guy who wanted more control got more control? It was just two seasons ago that the Raiders were 12-4, and McKenzie was picked as NFL Executive of the Year. 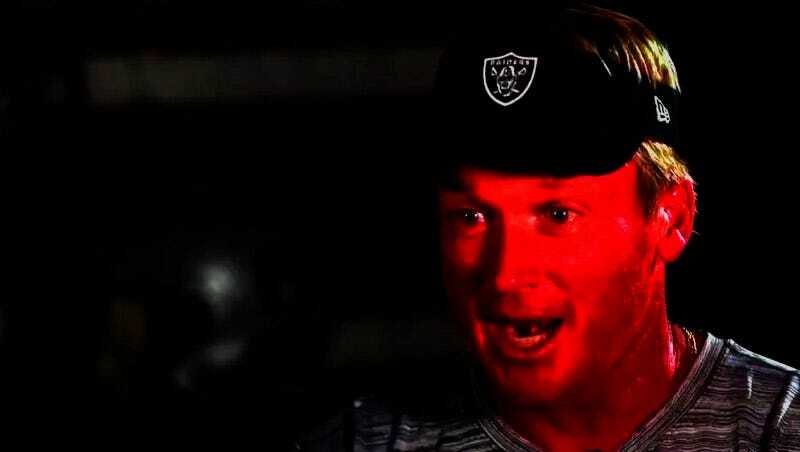 Gruden aspires to once again reach those heights, but not before he gets all his guys in the building, and pushes out the ones who don’t pledge fealty to the visor.